in an animation from NASA, showing what happens globally to create the large, slow current called the thermohaline circulation. And now this week brings news of another potential mega-scale perturbation. According to a new study just out in Nature Climate Change by Stefan Rahmstorf of the Potsdam Institute for Climate Impact Research and a group of co-authors, we’re now seeing a slowdown of the great ocean circulation that, among other planetary roles, helps to partly drive the Gulf Stream off the U.S. east coast. The consequences could be dire – including significant extra sea level rise for coastal cities like New York and Boston. The Gulf Stream system is one of Earth's most important heat transport systems. Now, though, scientists have found evidence for a slowdown of this system, which could have major implications for climate. A vast, powerful, and warm current, the Gulf Stream transports more water than “all the world’s rivers combined,” according to the National Oceanic and Atmospheric Administration. But it’s just one part of a larger regional ocean conveyor system – scientists technically call it the “Atlantic meridional overturning circulation” — which, in turn, is just one part of the larger global “thermohaline” circulation (“thermohaline” conjoins terms meaning “temperature” and “salty”). For the whole system, a key driver occurs in the North Atlantic ocean. Here, the warm Gulf Stream flows northward into cooler waters and splits into what is called the North Atlantic Current. This stream flows still further toward northern latitudes — until it reaches points where colder, salty water sinks due to its greater density, and then travels back southward at depth. This “overturning circulation” plays a major role in the climate because it brings warm water northward, thereby helping to warm Europe’s climate, and also sends cold water back towards the tropics. Graph of the Atlantic Meridional Overturning Circulation by Stefan Rahmstorf from the Potsdam Institute for Climate Impact Research. Red colors are surface currents, blue colors are below the surface. “NADW” stands for North Atlantic Deep Water. The system above has a key vulnerability. What keeps everything churning in the North Atlantic is the fact that cold salt water is more dense than warm water — so it sinks. However, if too much ice melts in the region — from, say Greenland — a freshening of the cold salt water could occur. If the water is less salty it will also be less dense, reducing its tendency to sink below the surface. This could slow or even eventually shut down the circulation. In the scientifically panned 2004 blockbuster film “The Day After Tomorrow,” it is precisely such a shutdown that triggers a New Ice Age, and utter global disaster and chaos. That’s not going to happen, say scientists. Nonetheless, the new research finds that global warming does indeed seem to be slowing down the circulation. And while hardly catastrophic, that can’t be good news. Among the very real effects, notes the Potsdam Institute’s Rahmstorf, could be a possible increase in U.S. sea level if the whole circulation were to break down — which would be seriously bad news for cities like New York and Boston. The study uses a reconstruction of sea surface temperatures in the North Atlantic to find that starting in around 1970 or 1975, the overturning circulation started to weaken — an event likely triggered by an unusual amount of sea ice traveling out of the Arctic ocean, melting, and causing freshening. The circulation then started to recover in the 1990s, but “it seems this was only a temporary recovery, and now it’s actually further weakened,” says Rahmstorf. Despite all the warming that’s taken place since 1970, one little blip of the North Atlantic (shown here in green) has begun to actually cool. The hypothesized reason for further declines presented by the paper is that the massive Greenland ice sheet may now be losing enough freshwater due to melting to weaken the circulation. And indeed, it appears that a particular ocean region of the North Atlantic south of Greenland and between Canada and Britain is becoming colder — an indicator of less northward heat transport. Rahmstorf points to a recent release by the National Climatic Data Center of the National Oceanic and Atmospheric Administration, finding that the winter of December 2014 through February 2015 was the warmest on record for the globe as a whole. So far, the study finds, we’re looking at a circulation that’s about 15 to 20 percent weaker. That may not sound like much, but the paper suggests a weakening this strong has not happened at any time since the year 900. Moreover, this is already more weakening than scientifically expected — and could be the beginning of a further slowdown that could have great consequences. The U.N.’s Intergovernmental Panel on Climate Change, in 2013, said it was “very likely” that the Atlantic overturning circulation would weaken over the course of this century, but gave a gigantic range of from 1 to 54 percent, with best estimates at 11 and 34 percent. We’re already in that window, suggests the new study, and it’s only 2015. So what would happen if the circulation weakens even more substantially or even shuts down? One thing that will not happen from a shutdown of the circulation is a sudden, dramatic freezing of Europe. It will certainly cool, relative to a world in which the circulation remains robust — but that will be offset by rising average temperatures due to global warming, says Rahmstorf. The “Day After Tomorrow” scenario will not come to pass. That may sound surprising, but here’s how it works. We’re starting out from a situation in which sea level is “anomalously low” off the U.S. east coast due to the motion of the Gulf Stream. This is for at least two reasons. First, explains Rahmstorf’s co-author Michael Mann of Penn State University, there’s the matter of temperature contrast: Waters to the right or east of the Gulf Stream, in the direction of Europe, are warmer than those on its left or west. Warm water expands and takes up more area than denser cold water, so sea level is also higher to the right side of the current, and lower off our coast. But there’s another factor, too, involving what is called the “geostrophic balance of forces” in the ocean. This gets wonky, but the bottom line result is that “sea surface slope perpendicular to any current flow, like the Gulf Stream, has a higher sea level on its right hand side, and the lower sea level on the left hand slide,” says Rahmstorf. 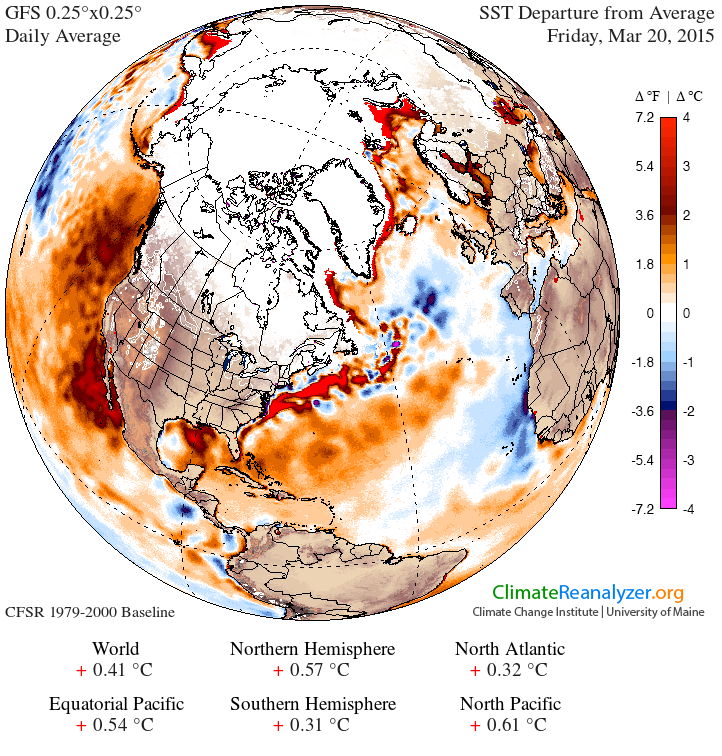 Sea surface temperature anomaly on 20 March 2015. Note that this is relative to a baseline 1979-2000, which is already a cold period in the subpolar Atlantic. We’re on the left hand side of the Gulf Stream. So weaken the flow, and you also raise the sea level. Indeed, researchers recently found a sudden, 4-inch sea level rise of the U.S. East Coast in 2009 and 2010, which they attributed to a slowdown of the Atlantic overturning circulation. So in sum: It appears that we’ve just seen yet another surprise from the climate system — and yet another process, like the melting of Antarctica, that seems to be happening faster than previously expected. And indeed, much like with that melting, the upshot if the trend continues is an especially bad sea level rise for the United States — the country more responsible than any other on Earth for the global warming that we’re currently experiencing.